Last Saturday May 4th, the Norwegian Epic came back to the port of Palma de Mallorca after one year’s absence. Of course this is are great news for the island, as this giant of the seas will visit Majorca every Saturday. The NCL Epic, the largest ship ever constructed in STX Europe´s french shipyard in St.Nazaireis just a tad larger than Quen Mary 2. The cost of this huge vessel was 735 million dolars, and started to sail in june 2010. NCL Epic fly the Panamenian flag and belongs Norwegian Cruise Line. The ship has a tonnage 153,000, and the lenght of this huge ship is 325 mtrs or 1066 feets. NCL Epic is equiped with diesel-electric propellers (79.6 Mw). NCL Epic has 15 passanger decks, 16 elevators, 4 outdoor swimming pools, 1 indoor swimming pool and 9 whirlpols, a large rock climbing Wall and a rappelling Wall. The pool deck has an aqua park, with 3 major waterslides and aft is a large movie screen with amphiteather style, and a nighclub. The 3 lowest passenger decks contains the main entertainment venues for passengers as restaurants, show lounges and a of course a large casino. The amazing main lobby on NCL EPIC is 3 decks high with an impressive chandelier. A novel feature in the NCL Epic, is the ice bar, inspired by the original ice bars or ice hotels in Scandinavia, with a giant ice cube on the center changing color, the ice bar accomodates 25 passangers which recive a fur coat, gloves and hat to to get in, because its temperatura does not rise above -8 ºC or 17ºF. NCL Epic hosts 4200 to 5400 passangers and 1730 crew members. The NCL Epic has 21 restaurants, dinning venues or casual eateries to accomodate all the guests, remember is a free style dining plan on norwegian cruises. For relax time on board, do not miss a visit to the Smile Spa and Pulse fitness center complex ,is possibily the largest at the high seas (31000sq.feets or 2880 sq.meters) operated by the Steiner-owned Mandara spa, with 24 treatments rooms. 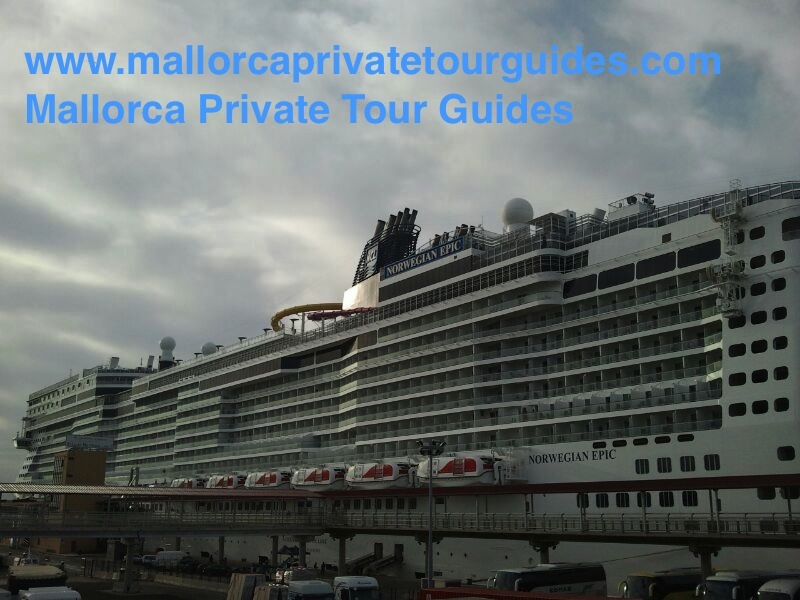 If you are planning a cruise to Mallorca on board the NCL EPIC let us to help you with your shore excursions, the guides of Mallorca Private Tour Guides will be at your disposal to help you. Let us guide you in one of the most beautiful mediterranean ports, Palma de Mallorca, discover Mallorca with Mallorca Private Tour guides. This entry was posted in Mallorca events, Palma de Mallorca Port & Cruises and tagged bar, Bob, cirque, cruise, cruises, deck, decks, Diego, dinning, Dora the explorer, Epic, excursion, excursions, free, free style, giant, guides, high seas, hotel, ice, let us guide you, line, mallorca, mandara, mediterranean, Ncl, nickelodeon, norwegian, palma de mallorca, passenger, passengers, port of call, private, pulse fitness, saturday, seas, shore, smile, spa, spigel tent, Sponge, steiner, style, tour, vessel. Bookmark the permalink.